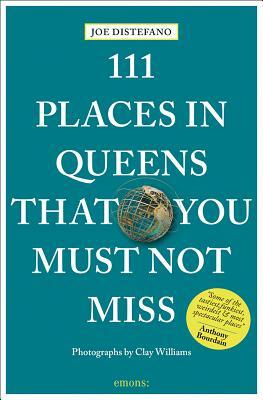 - The ultimate insider's guide to Queens- Features interesting and unusual places not found in traditional travel guides- Part of the international 111 Places/111 Shops series with over 170 titles and 1 million copies in print worldwide- Appeals to both the local market (nearly 2.3 million people call Queens home) and the tourist market (over 50 million people visit New York City every year )- Fully illustrated with 111 full-page color photographsStaggering ethnic diversity, rich cultural history, and a robust arts scene make Queens one of the most exciting destinations in all of New York City. See and taste the world, travel back in time, and experience nature all without leaving the confines of Queens. Home to immigrants from Azerbaijan to Vietnam and everywhere in between, Queens is truly a melting pot of cultures and cuisines. Eat your way through China, Malaysia, Romania, and visit a Tibetan dumpling speakeasy - no passport necessary. Visit the birthplace of religious freedom in America and then tour local Hindu, Thai and Korean temples. Marvel at migratory birds and terrapins and visit the oldest tree in New York City. Whether you're a first time visitor or a long-time resident, you'll find 111 hidden places in Queens. The most majestic of New York City's boroughs is yours to explore and discover. Queens-based food writer, culinary tour guide and champion of Queens Joe DiStefano has been exploring the borough's diverse global cuisines and cultures for more than a decade. He's fond of referring to the bustling Chinatown that is downtown Flushing as 'America's Greatest Chinatown'. An intrepid eater and explorer, he's widely recognized by such culinary luminaries as Andrew Zimmern as a go-to source on the borough's rich tapestry of cuisines and cultures, from Michelin-starred temples of gastronomy to actual Thai and Hindu temples where food is served. He is the founder and publisher of the Queenscentric food blog CHOPSTICKS & MARROW, and a co-founder of New York Epicurean Events and Queens Dinner Club. His work has appeared in The New York Times, Gourmet, Food Republic, and Serious Eats. His clients include Starbucks, the Boys Club of New York, Hormel, The Food Group, and Next Restaurant. DiStefano aims to shoot a video teaser showing some of the places featured in this book, and perhaps plan a scavenger hunt revolving around one of the featured neighborhoods, most likely Jackson Heights. In addition to DiStefano's robust social media presence, he is something of a local celebrity having appeared on the Queens episode of Bizarre Foods With Andrew Zimmern.Born in Queens, raised in Brooklyn, Clay Williams is a lifelong New Yorker who photographs food, drinks and events for The New York Times, Edible Communities magazines, and the James Beard Foundation. With his camera in tow, Clay has hung on to the back of food trucks in Paris, trudged through farms in Argentina, and squeezed into tiny kitchens with world famous chefs. When he's not documenting the food system, he's at home, cooking dishes inspired by what he photographs every day. Clay lives in Sunset Park, Brooklyn, with his wife Tammi, a fellow New York native.